This Is How Instant Justice Looks Like! - Muscle Cars Zone! This Is How Instant Justice Looks Like! There are tons of interesting videos you can see on the social media hence people share their everyday situations and problems that they have caught on video. Have you ever been in a situation when you faced an undercover cop where you did not that he was a cop at all? If you have so, you exactly know how that feels. Hereby, we check out this video in which the Camaro driver experienced what real instant justice is and how it looks like. Namely, the man behind him took his phone out and started recording hence he knew what was about to happen. There was a red Dodge Challenger behind the blue Camaro, and little did the blue car driver know that behind the steering wheel of that furious Challenger is actually a cop. Police officers often use these undercover vehicles to chase after people who break the law when they think that there is no cop around. 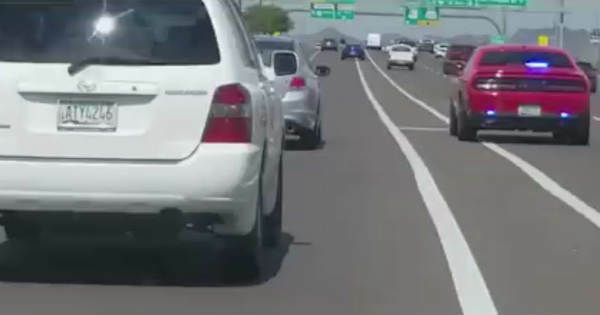 We have previously come across a video in which an undercover police officer rides his bike and catches people who use their phones while driving. Even though we cannot see what happened next hence the video ended when the Challenger started chasing after the Camaro. Nonetheless, we can all assume that the man was pulled over shortly after and that he got a quick lesson on how instant justice looks like and why he should never break the law and cross the double white line on the highway!